Enter the world of Oliver Moon, Junior Wizard, in these fun illustrated adventures full of gruesome details, extraordinary characters and a massive dose of magic. Everyone at Oliver's school is really excited about taking part in the annual Festival of Magic parade, but Oliver is stuck with the boring job of picking up the litter. When his little sister Witch Baby hatches a baby dragon at home, Oliver sees his chance to liven his role up. But things don't quite go to plan..
Oliver's mum has caught Green Flu so Oliver is in charge of all the housework. There's a lot to do - recharging the wands, washing the cloaks, not to mention looking after the Witch Baby and her pet spider! Everything is okay until Oliver tries a Grow-bigger spell on the cauldron. Then he finds himself in very BIG trouble indeed. Fans of 'Oliver Moon' will snap up this brilliant new adventure, but arachnophobics be warned! Oliver is excited about entering the Junior Wizards' Obstacle Course in the annual Broomstick Olympics, but Bully Bogeywort is intent on ruining Oliver's chances of winning. Can Oliver overcome Bully's cheating tactics? Enjoy magical mayhem, hi-jinx and hocus-pocus in the illustrated adventures of Oliver Moon, Junior Wizard - full of gruesome details and extraordinary characters.Oliver is thrilled by the prospect of performing in the school play...until he's cast as a big, bad, blundering troll. Deciding to make the best of it, he sets to researching his character on the Wizard Wide Web. And when an unexpected guest turns up to opening night, it looks like Oliver's new-found knowledge of trolls is going to be needed for more than just acting...Thrills and spills ensue in the latest fearsomely funny Oliver Moon adventure - another magical treat for boys everywhere. Enjoy magical mayhem, hi-jinx and hocus-pocus in the illustrated adventures of Oliver Moon, Junior Wizard - full of gruesome details and extraordinary characters.When Oliver wins the school raffle, he is less than impressed with his prize - an ugly painting entitled Monster Mystery. As soon as the Moons hang it on their kitchen wall, food starts whizzing through the air, crockery smashes itself on the floor and strange messages appear in Oliver's schoolbooks. Something strange is going on - and it's up to Oliver to solve the mystery behind it to claim his real prize. Full of ghoulish goings-on, this is another fantastically funny and seriously scary tale to delight wizard wannabes everywhere. Oliver Moon is having a wail of a time at his spooky school sleepover in the haunted museum. But then he's cursed by a bad luck jinx and things start to go terribly wrong. Oliver didn't intend to summon such very, VERY scary guests... Will Oliver and his class survive the night? Enjoy magical mayhem, hi-jinx and hocus-pocus in the illustrated adventures of Oliver Moon, Junior Wizard - full of gruesome details and extraordinary characters.Oliver can't wait for his birthday party...until a mix-up with the invitations means that he's lumbered with some unwanted guests. When food starts disappearing and presents go missing, it looks like Oliver's party is set for disaster. Can Oliver stop the party-poopers in time to have a magical birthday? The perfect present for any birthday boy, fans of "Oliver Moon" will snap up this brilliant new adventure. 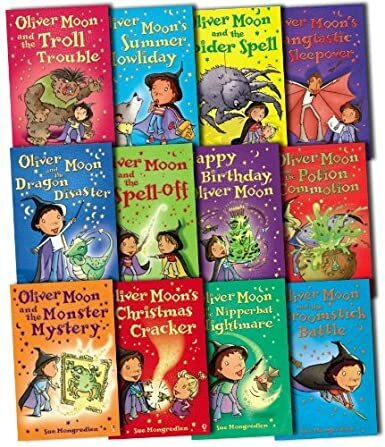 Enter the magical world of Oliver Moon, Junior Wizard, in these fun illustrated adventures full of gruesome details and extraordinary characters. Oliver is really looking forward to his summer holiday in the haunted forest. He can't wait to go ghost hunting and he'd love to meet the werewolves that are rumoured to live there. But his parents are not happy about the noisy howling that goes on in the forest at night. Could Oliver's hairy new friend, Wilf, have anything to do with it. Oliver Moon Collection 12 Books Set Pack by Sue Mongredien. Excellent and Highly Recommended. It is nice.